What started as a murmur in early October from First Nations People in Canada in response to Bill C45 has become a movement that echoes the sentiments of people all over the world, a battle cry of love for the planet, "Idle No More." At first glance it might appear that this movement is isolated and doesn't effect you if you are not native or if you don't live in Canada, yet it does. It may appear that this resistance is not related to The Occupy Movement, The Arab Spring, The Unify Movement, Anonymous, or any of the other popular uprisings sparked by social unrest, but it is. At its very core, all of these movements have very common threads and are born from common issues facing people everywhere. Those who represent financial interests that value money over life itself, that are devoid of basic respect for human decency, and for nature have dictated the future for too long and people everywhere are standing up to say, "No more." This non-violent social uprising is viral in the minds and hearts of everyone across the planet determined to bring healing to our troubled communities, our planet, and the corruption that is eroding the highest places of governments around the world. Flashmobs with dancing and drumming at a malls in Olympia, Wash. Tempe, Ariz., Denver, Colo., a giant circle dance blocking a large intersection in Winnipeg, rail blockades in Quebec, this movement is using cultural expression combined with modern activism to get attention, and it is working. From their website, "Idle No More calls on all people to join in a revolution which honors and fulfills Indigenous sovereignty which protects the land and water. Colonization continues through attacks to Indigenous rights and damage to the land and water." 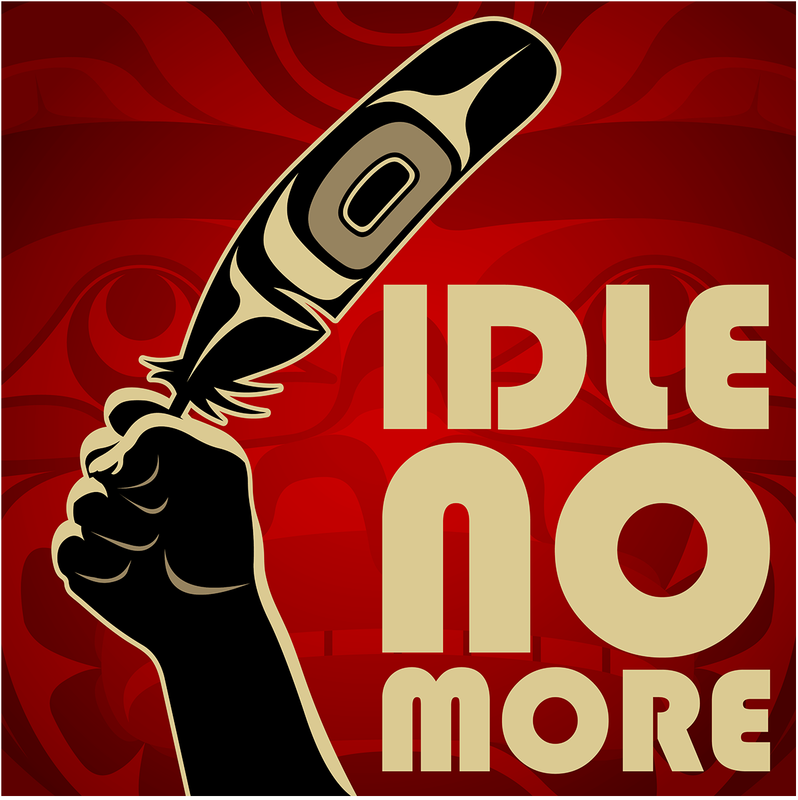 Idle No More was started in October by four ladies; Nina Wilson, Sylvia McAdam, Jessica Gordon & Sheelah McLean who felt it was "urgent to act on current and upcoming legislation that not only affects First Nations people but the rest of Canada's citizens, lands and waters." On December 11 Attawapiskat Chief, Theresa Spence, launched a hunger strike requesting a face-to-face meeting with Canadian Prime Minister Stephen Harper to discuss broken treaties and protection of natural resources. Spence is staying in a tipi on the frozen Ottawa River facing Parliament Hill and has gained the support from many natives and non-natives who are in solidarity with this movement. This effort to protect Mother Earth is all Humanity's responsibility, not just Aboriginal People. Every human being has had Ancestors in their lineage that understood their umbilical cord to the Earth, understanding the need to always protect and thank her. Therefore, all Humanity has to re-connect to their own Indigenous Roots of their lineage -- to heal their connection and responsibility with Mother Earth and become a united voice... All Nations, All Faiths, One Prayer. Society and nature work in similar ways to our own body's immune system. We are given a symptom that causes us to be aware that there is an illness that needs to be addressed. We can try to suppress the symptom, but that does not heal the illness. Popular uprisings with very core commonalities are spreading all over the planet. Exploitation of our environment, as well as the exploitation of people and cultures for the sake of financial gain is immoral and must be stopped at the highest levels of our governments. It is possible to have a thriving economy and environmental ethics. Here in America, the response to Occupy is tucked into NDAA as Washington prepares ways to suppress the symptoms of social discord. Without addressing the illness at its root nothing will change. It is like the mythical Many-Headed Hydra, if you cut one head off, two more will grow back. Popular uprisings will continue here and all over the world until leaders understand that people want real fundamental change in policy. Governments should lead by example if they want to be respected. With Twitter, Facebook and the internet, these separate movements are finding solidarity with each other and converging as a global super-movement for the planet and all people. The quote used at Unify is, "Everyone, Everywhere, Together" and it is beginning to resonate more than ever. Each of these movements share a commitment to non-violent revolution in their call to end the exploitation of people and the exploitation of natural resources. Sustainability can be applied to all aspects of social rights, economics and the environment. Social, economic, cultural, and environmental movements, resistance, civil disobedience, flash mobs and more will continue until this is addressed at home and abroad. Whether it is Anonymous and Wikileaks exposing the corruption of governments, or Indians with drums dancing and chanting in a local mall, people everywhere are awakening, speaking up, and acting for the needed changes. It's time for politicians and religious leaders to get the message everywhere. It is a simple choice: continue to be part of the cancer that slowly destroys our water, our air and the resources that are the fabric of life by staying unconscious, or become the conscious antidote that slowly kills the cancerous disease which threatens the existence of life on the planet? Is the disease capitalism, corruption, ignorance, greed, The Illuminati, or some combination of all of these things spiralling out of control? It doesn't matter because it is becoming obvious that there are people from all nationalities, religions, and cultural backgrounds who are determined to resist the progression of imminent destruction. A factory producing monkey wrenches for the gears of the machine which is at the center of our collective demise. Will the leaders wake up to this in order to play the roles they have sworn to uphold or will they further discredit their position, their institutions, and help to destroy the very systems that they have been entrusted to maintain? Every time Congress represents the will of a few wealthy people over the interests and the well-being of the planet and the people, they do more to subvert and destroy the state than ten thousand people protesting in the streets. When leaders fail, they destroy the trust that holds society together. Is Harper cold and callous enough to ignore a constituent on hunger strike a short distance from his office? Can he afford to ignore these issues? Can any of us afford to ignore this call to be idle no more? Take a moment and listen to the eloquent words of an 11-year-old girl in the video below. If a child can understand this, how come world leaders are still silent on making real changes to address these urgent issues? 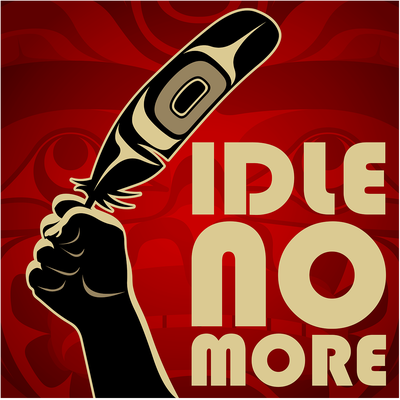 Please support Idle No More, learn more about the movement, how it effects all of us and get involved. All of our futures depend on it.